There is no need to beat around the bush. 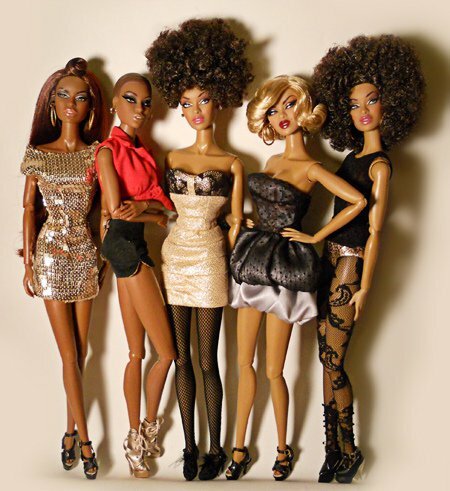 We tend to be curvier than other women…hips, bigger bootay just curvier. Having those assets tend to make finding jeans that fit properly a chore. Cookie Johnson, wife of Magic Johnson found it difficult to find jeans for her healthy size 8 frame. I imagine her frustration inspired her to design her own jean line, CJ by Cookie Johnson. Cookie says there are three questions everyone should ask themselves when they put on a pair of jeans. Are they comfortable to walk in? Are they too tight in the thighs? Do they come up high enough in the back to cover your goods? “If you can sit down and nothing comes out, that’s the pair of jeans for you,” she says. To offer a skinny jean to curvy women, Cookie created the Joy legging style. “Leggings are really popular right now,” she says. “We decided to create a denim legging. Since CJ by Cookie Johnson jeans are for a wide range of body shapes, they come in a wide range of sizes. “They start at 24 to 38,” Cookie says. “Which translates from size 2 to size 18.” Another reason Adam is such a huge fan is that the jeans have clean lines. “I love that there aren’t a lot of doodads on the back pockets,” he says. “They don’t sag. You can wear them all day long and you still look great in these jeans. And the fabric is not too thick. I think that’s the key to jeans.”The Faith jean is the straight-cut option. “That’s for the woman who doesn’t want to wear the clingy legging but wants a straight leg,” Cookie says. In order to make her jeans work for curvy women, Cookie says the jean comes up higher in the back than most jeans do. “I left them stylishly low in the front so they don’t come up and you feel like you’re wearing your mother’s jeans,” she says. “They come up high enough that they cover what they need to cover but they still have style. The Boot Cut is CJ by Cookie Johnson’s basic style. “It’s a little slimmer on the top and then it flares a little bit at the bottom,” Cookie says. If you’re looking to dress up your jeans, Cookie says the Truth style, which has a high waist and wide leg, is the best bet. “That’s the jean you want to wear if you want to go out to a nice dinner or for some of you who can wear jeans to work, you can pair them with a great blazer, put on a heel and go to work. 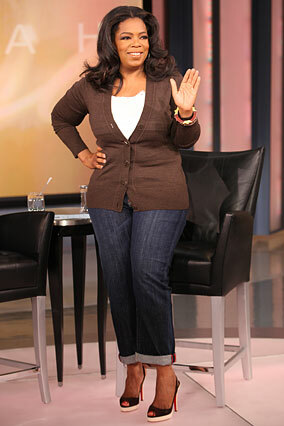 Though CJ by Cookie Johnson are Oprah’s favorite jeans, she says she knows the $141 to $198 price tag is steep. “They’re definitely on the high end,” Oprah says “A splurge.” If you’re looking for a more affordable jean that still has Adam Glassman’s fashion seal of approval, check out his budget-conscious denim recommendation.